Wn351 Auderville la Roche H.K.B. 1./1262 "Stahl", K.V.U.Gruppe Joburg, K.V.Gruppe Periers. Wn351 Auderville la Roche H.K.B. 1./1262 "Stahl". 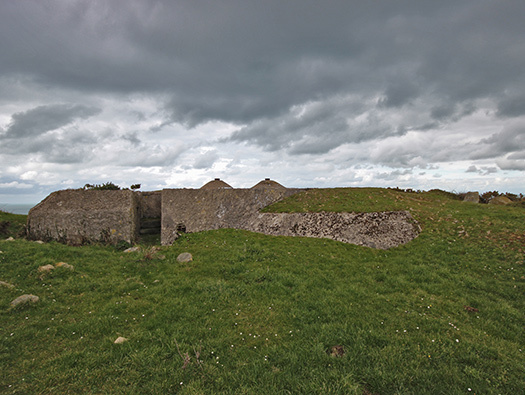 4 x R679 casemates (one under construction). 1 x R636 Fire Control Post. 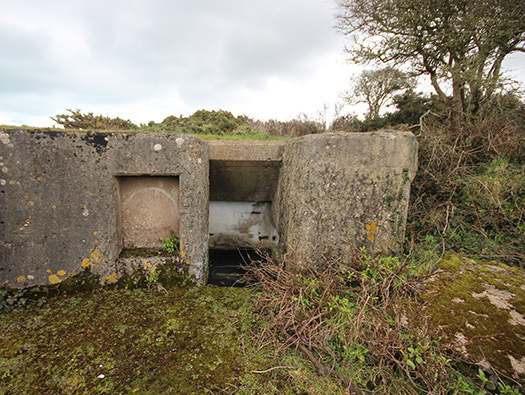 4 x R134 Ammunition bunkers. 2 x R622 twin gruppe bunker. 2 x R621 gruppe bunker. 6 x 15.5cm K.416(f) guns. 3 x 2cm Flak 30. 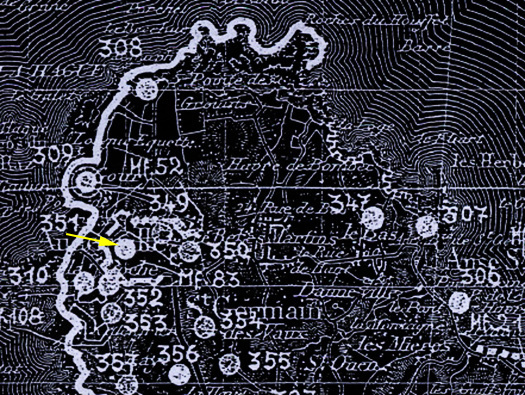 This German plan shows all the defences around Cap de la Hague. Wn351 could fire 360° from its six open emplacements. 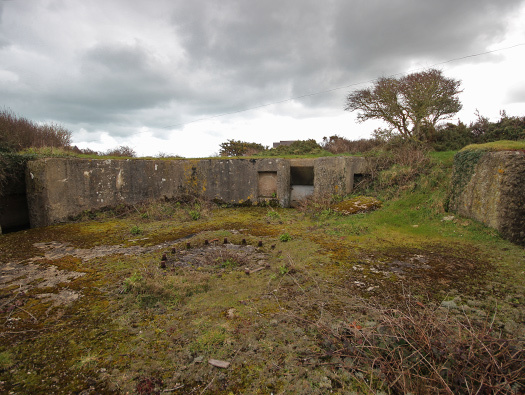 But due to Allied bombing Hitler ordered casemates to be built to protect the guns. So four R679's were in the process of being built. La Roche. 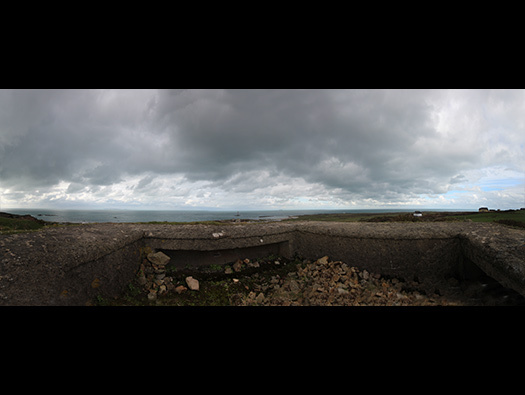 Medium Coast Battery. Inter-service Target N°. 9/J/473. Allied air-photo overlay of Wn351, six x 155mm. Rate of Fire 2 r.p.m. USAAF Lightening´s also too a lot of air photos. 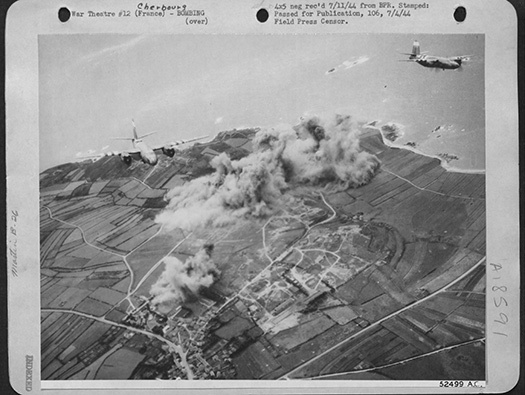 American Marauder medium bombers carpet bombing the battery of Wn351. The picture shows a Marauder with D-Day stripes on its wings, so this picture must be post D-day as the stripes were painted on no earlier than the 4/5 June. 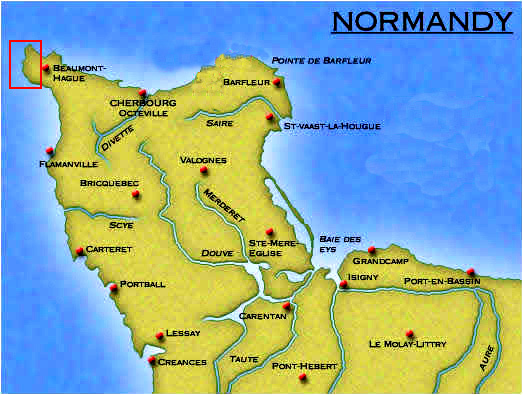 I believe 7 July 1944. 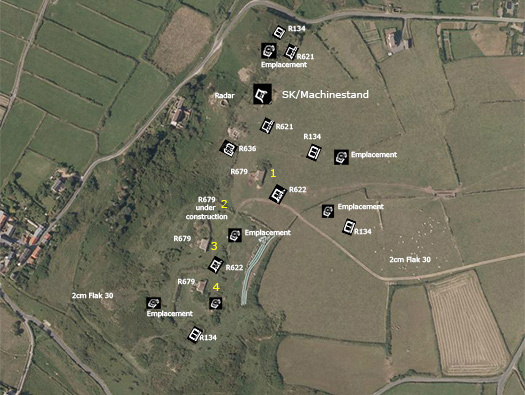 Two ages of a batterie position are here. 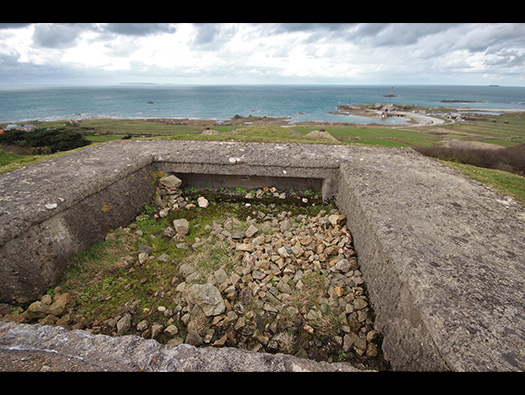 First the six open emplacements and then the four casemates. 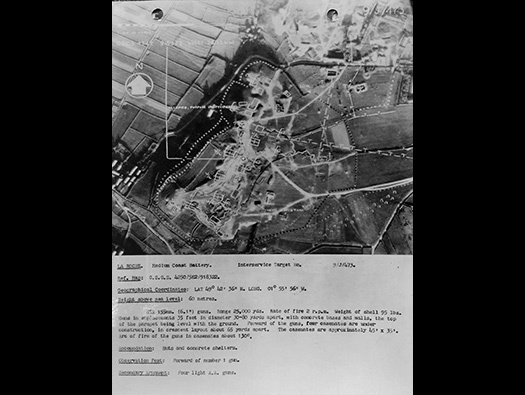 Due to heavy Allied bombing Hitler insisted batteries were to b casemated to give them better protection and on the 29 June 19444 it was heavily bombed and many of the open emplacements were hit badly. Nice view from under the hill showing how high the guns were placed 60meters I believe. Two of the R679, Turm 3 & 4. Inside the gun room (Gatteville) with a steel shield covering the guns embrasure. 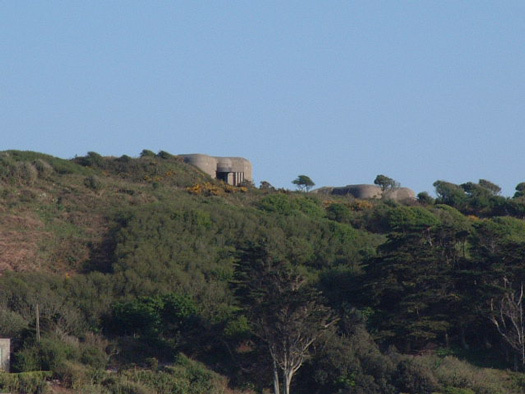 The batterie position from the rear. Turm 3 & 4 with Turm 1 to the far right. Turm 2 was under-construction. 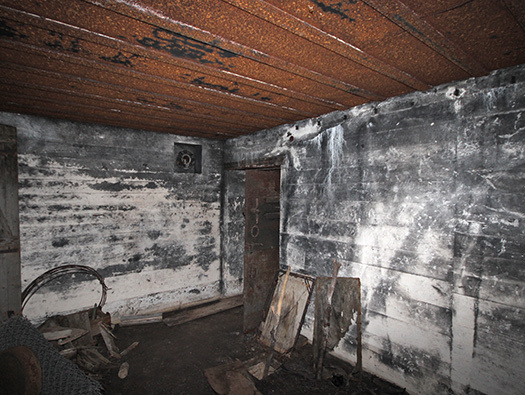 A twin room'd ammunition magazine. Inside an R134 ammunition room. 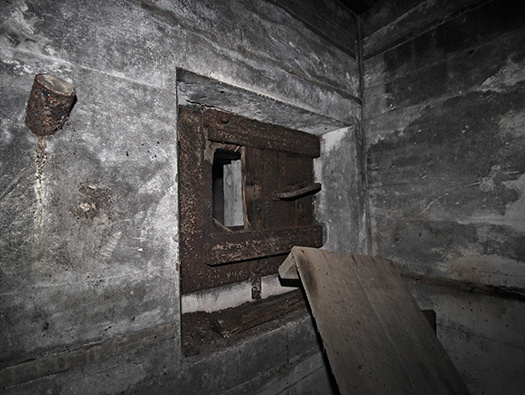 The two panels either side of the embrasure would have had metal plates bolted on and the four threads per side are still there. Inside an R679 at Gatteville. This is the left panel where the metal plates bolted on and one nut still in place. 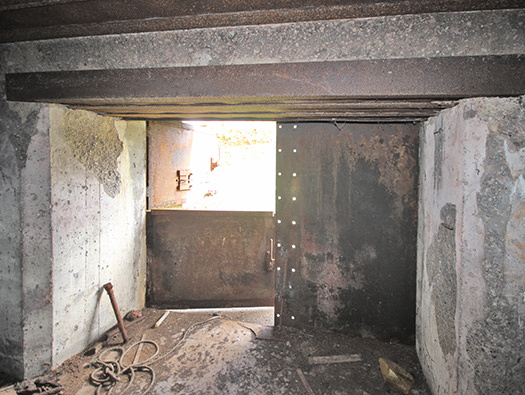 I have seen many R679 casemates but never have I seen a steel panel. I do not think many were ever fitted. 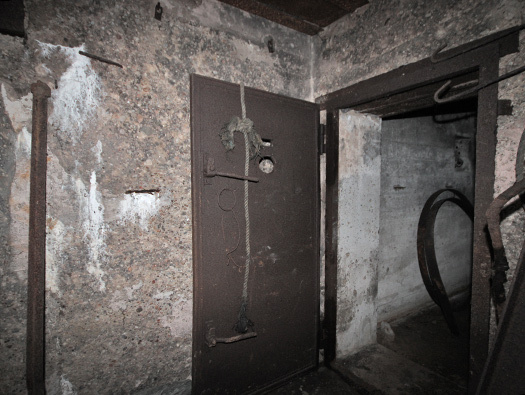 The gun room with two ammunition niches each side and the rear door. R679 elevation showing where the gun sat. 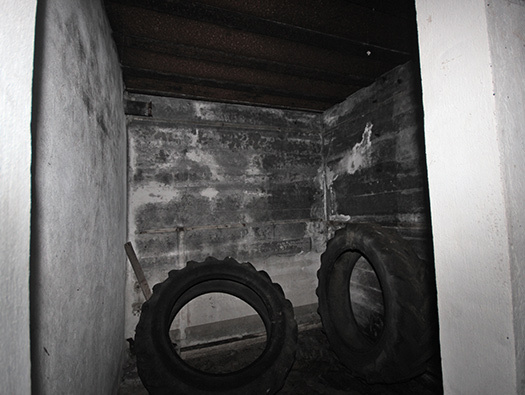 R679 plan with two ammunition niches either side and a rear entrance that should have a steel door. 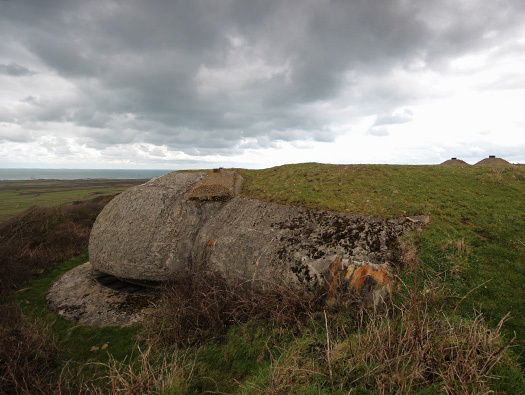 Again these often were not fitted due to the D-day invasion. Turm 3 has the two panels each side just like the last one but this one has a larger steel band around the top of the embrasure. This is just showing some detail of the panel and a concrete glasses plate that would have been completed when the gun was fitted. Turm 3 R679 casemate from the rear & Turm 4 in the distance.. The rear entrance with a steel frame and lintel but no door. Turm 2 would have been somewhere around here. 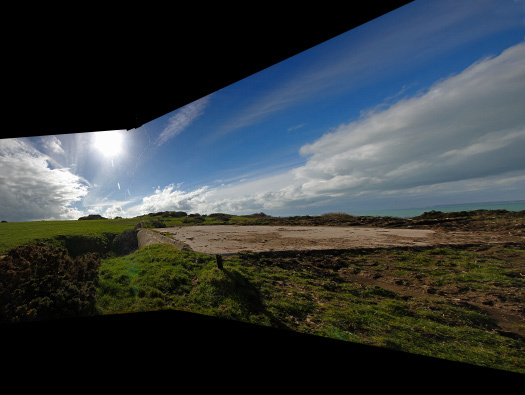 Note the earth placed around the sides of the casemate. It acts as camouflage and adds to the strength of the casemate. Railway lines were used extensively in the building of bunkers. This looks like one that was left over. 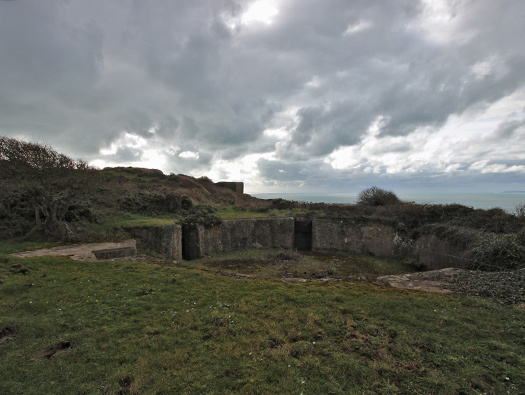 Set in a very good position in the front of the batterie, here fire control officers could pass information to each of the six guns laid out in open emplacements and also to any of the guns that had been set into the casemates. The air photo shows the Flak position and Tobruk in place. Even the two aerial slots. 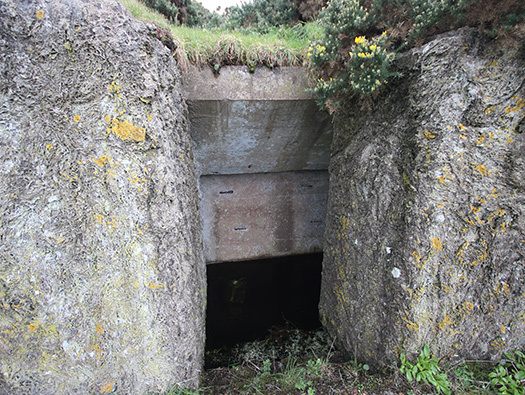 The rear of the bunker with an entrance for the Flak position and two large radio aerial fittings. R636 Fire Control Post. Flak position. 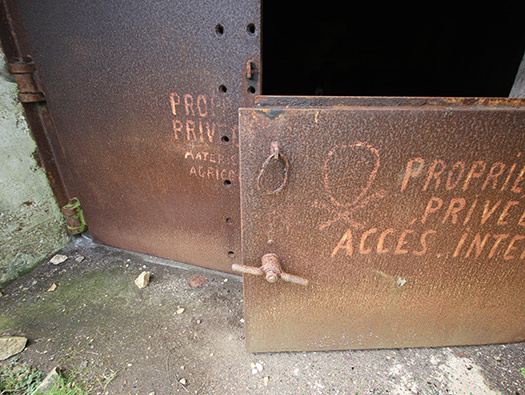 Rear entrance to the Flak position on the roof. Note the camouflaged concrete overlay. R636 Fire Control Post. Tobruk. The top of the Tobruk. Machine gun fittings in a Tobruk. Details of the lip where the machine-gun swivelled around. Plan of a machine gun mounting. Nice tight squeeze and a niche for a speaking tube. A pipe would go through the concrete of the bunker to somewhere inside and this was his only means of communication. 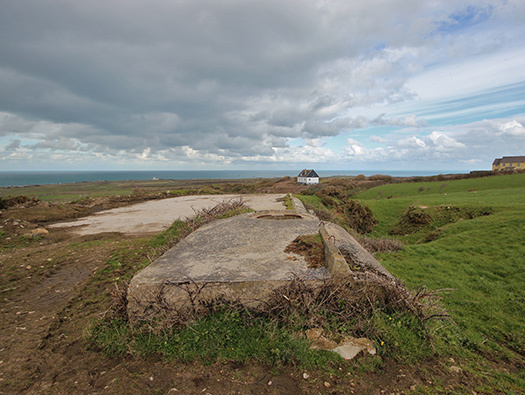 Flak position on the top of the R636. 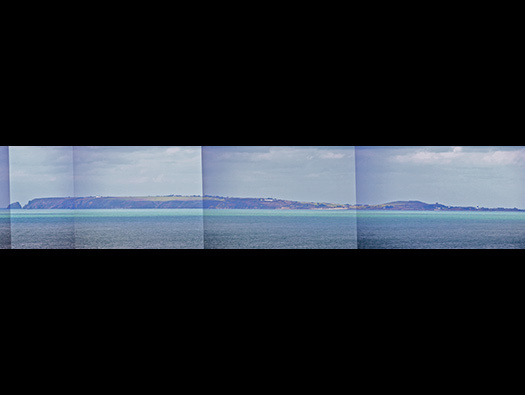 Alderney to the left and Cap de la Hague Lighthouse to the right. Ready ammunition space under lip. Now looking towards the rear of the site. R636 Fire Control Post. Radio aerial fittings. 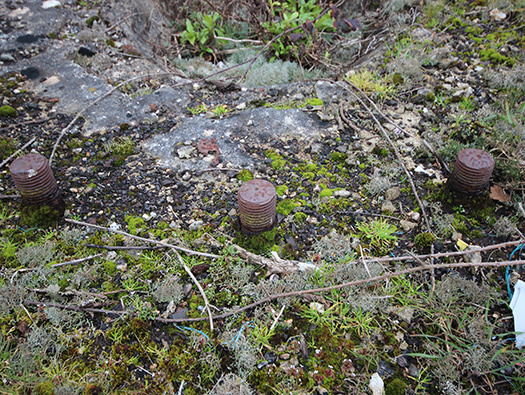 Two aerial fittings set into the rear of the bunker. Plan of an aerial fitting. How the aerial fitted inside a bunker. Plan of an aerial inside a bunker. R636 Fire Control Post plan. Looking into the observation room. Alderney with the Raz Blanchard this is the gap that the guns were protecting. The radar was designed to be used over the sea and was perfect for ranging the guns at Wn351. 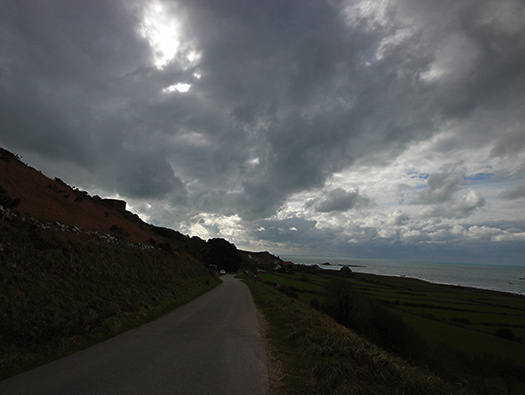 It could direct the guns on any target from here to Alderney. FuMO 2 Seetakt radar just after capture by the Americans. Camouflage around the radars defending wall. The view of where the radar searched. ADM 202-598 30 Assault Unit files. 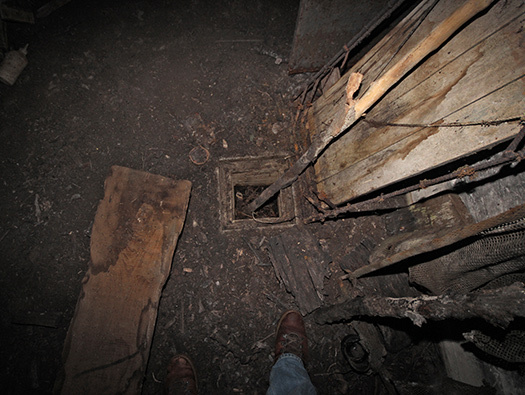 Looking into the emplacement where the radar sat. Stand fur Maschinensatz (stand for machine set). 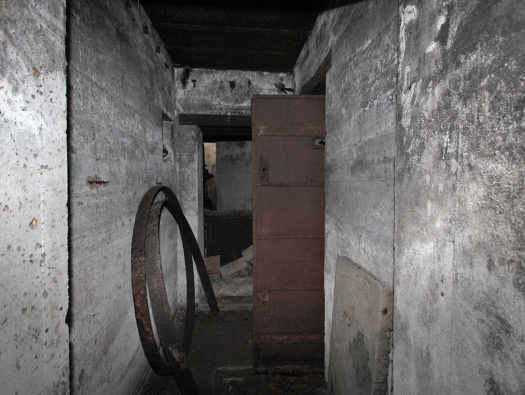 Maschinensatz was a bunker to hold the power to run the radar. Close combat & men's entrance. The roof of the Maschinensatz and a periscope fitting can be seen. The red dot on the plan is the position of the periscope. The attached Tobruk. Note the hooks for a camouflage net..
a: periscope fitting for the crew to look around when under attack. b: another fitting on the roof some way from the periscope. Periscope looking out of a bunker. The sunken way into the bunker. The 494P2 rear doors. 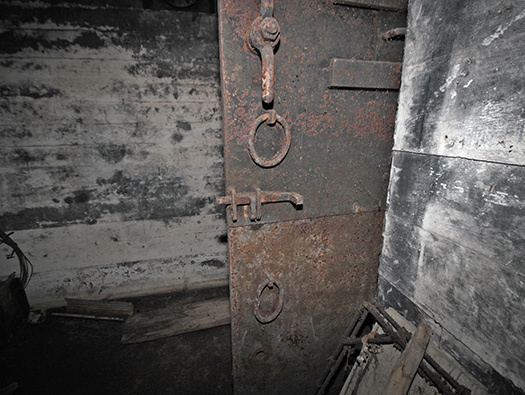 Heavy steel doors still in place. Set in three parts, one left and two right with a strip of steel bolted to the left door as a lip to shut the right door. This is a plan of the way a strip of steel was bolted to the left door and the right door would rest against it. 494P2 rear doors. The slot is for viewing or sticking out a rifle/sub-machine gun through it. 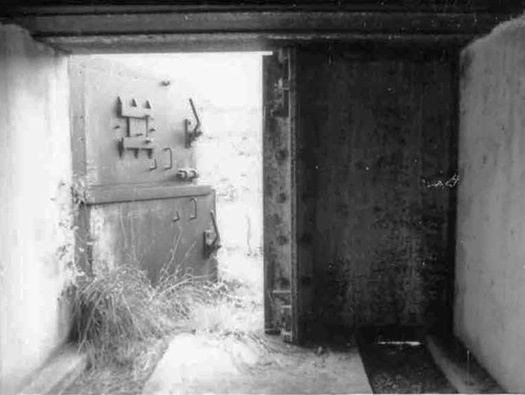 494P2 rear doors in another bunker showing how the door was configured. The main machine room. This is where a generator would have sat to power the radar. 434P01 left or right opening door. Just above the door is a 4ML01 equalising valve. This allows the internal and external air pressure equalise when there is a large explosion. Main room and quite a large space as well. A 19P7 thin steel door, gas tight with a glass viewing window. The large hole may be post war. The passageway to the crew quarters, close combat defence and the Tobruk access steps. Another 19P7 thin steel door into the crews quarters. The round steel pieces are actually steel wagon tyres. 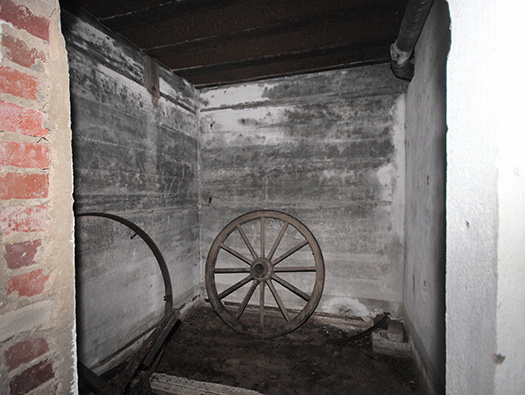 A wooden wagon wheel with a steel tyre fitted over the wood. The other small store room. 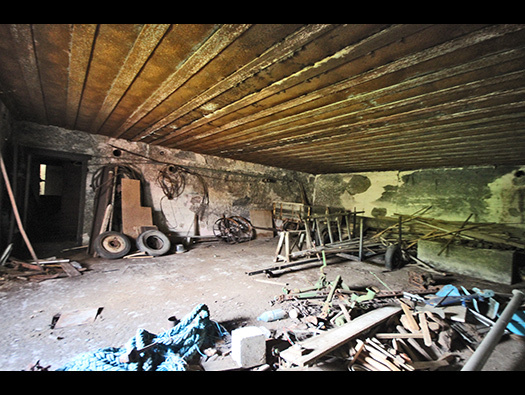 Crew room. The 19P7 thin steel door. 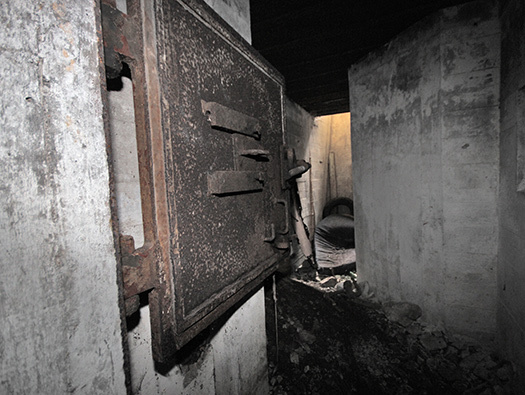 Close combat defence embrasure. 483P2 close combat defence embrasure. The way out to the Tobruk defence. Post action view of a Tobruk. This could be a Tobruk for an R621 Gruppe bunker or part of an R134 two room'd ammunition magazine. 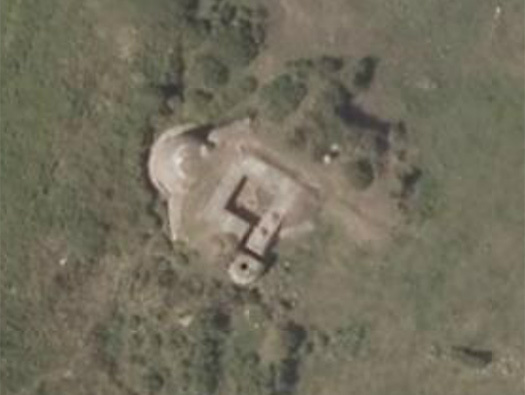 R134 twin ammunition magazine bunker. 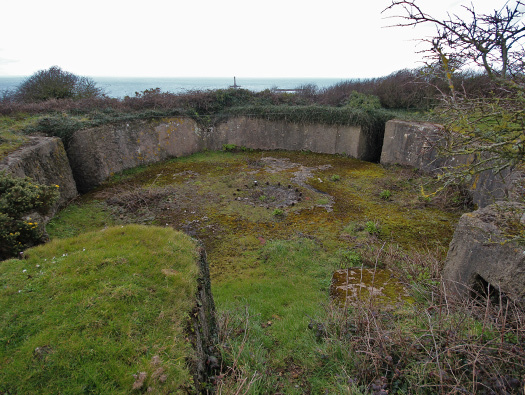 A large open emplacement for a 15.5cm K.416(f) gun, one of six that were here. A large space for quite big guns. The 15.5cm K.416(f) gun is quite a small chassis and barrel so fits easily. 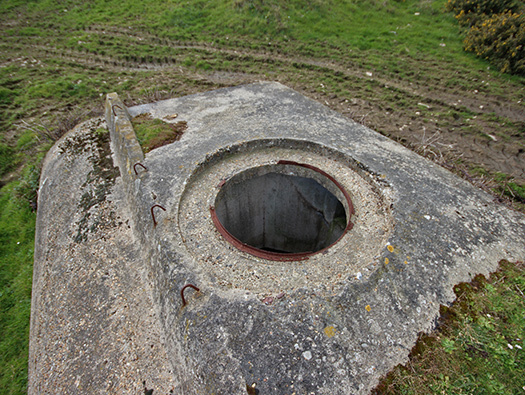 A large open emplacement for a 15.5cm K.416(f) gun. Entrance allowing ease of access for the gun. 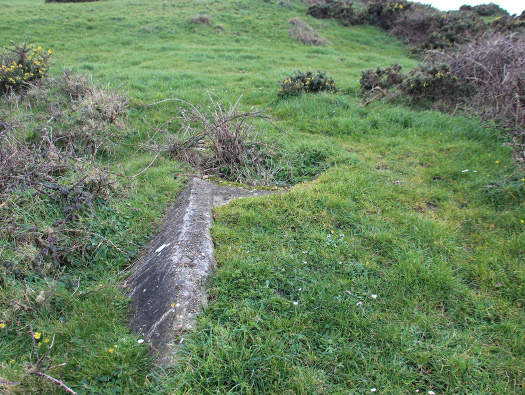 15.5cm K.416(f) gun In an open earth emplacement. This is how it would have looked here. Details of the gun may have been mounted. 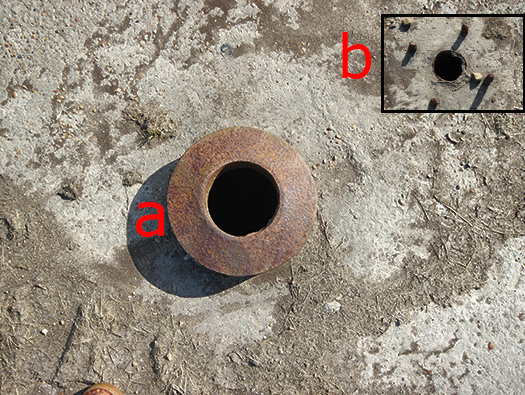 A base may have been bolted to the threads set into the concrete. A wooden plate then sat on the top swivelled in the centre that the gun could sit on. Another turntable design for a larger gun chassis. 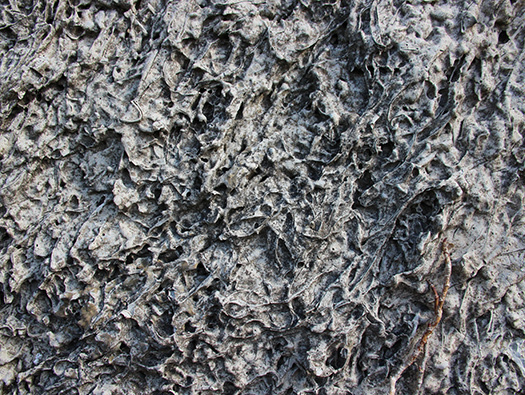 The threads set into the concrete. I am never sure what happened inside these niches, now filled with water. 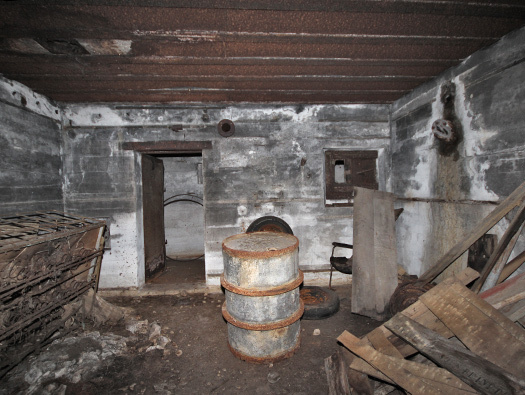 I think this is the side where ready ammunition was stored. Plan said to be from here. One side would be for ready ammunition and the other for general communications. Ammunition, cordite in cotton bags being passed to the gun..
Communications from the fire control post post via cables and past on to the guns crew. Walking back to the car showing the radar emplacement up on the hill.